Wheat acreage increases, averaging about 9 percent, were general for the 1947 crop. increases were only 2 and 4 percent. unchanged and soft red fell off I percent. Nebraska, Kansas, Oklahoma, Texas, and Colorado. Minnesota, North Dakota, South Dakota, and Montana. Virginia, West Virginia, North Carolina, Kentucky, and Tennessee. addition, the quality.of the corn orop-has been much better than had been expected. in terms of wheat will be exported, and possibly 6n million to 75 million fed. 6hgee, about 600 million bushels would't 64 available for export and carry-over. i:,as exported in the preceding 16 years. aboutt 75, and other countries, including Soviet Ruosia possibly 50 million. ae billion-bushel crops in our history, four of them in the last four years. but 300 million bushels for export. IE: Wheat prices remain high because of the large domestic and export demand. the new tax.year,- there may be a tendency for the price advance to be checked. flour for exports in February. ....TIB B aCMBE 1947 .4-.
in the importing countries is far greater than prewar. low levels tabless 3 and4 ). of 68 cents pc- buchel in 1940-41 to . ;2.74 in mid-November 1947.
has been much better than had been expected. irable balance between stocks and exports should not be made before next spring. ear before reducing stocks to a minimum level." rrent estimates we would still have 150 million bushels for carry-over next July. ere permitted to go that low last July only because of the good crop prospects. rk, exporting the most wheat ever exported in one year by a single nation.. Wheat prices remain high because of the large domestic and export demand. grains to be shipped this fiscal year yet to be purchased. million bushels under loan a year earlier. The acreage seeded to winter wheat for harvest in 1948 totals 58,848,000 acres. which is about one percent larger than the 58,068,000 acres seeded for the 1947 crop. date, an appraisal of soil moisture conditions and other factors affecting yields. for feed, 88 for seed), such a crop would leave about 300 million bushels for export. could produce a larger crop. responding reduction in the duty on flour. war and by poor crops in Southern Hemizchere countries and elsewhere. re'reported in areas where early seeding is essential. beneficial rains were received and reports from most areas are now more optimistic. : by'the Office of Foreign Agricultural Relations. This places most of that contiment in a serious food position again tht "
larger than the outturn this year. The wheat crop in North America is now estimated at 1,722 million bushels. million and the world total to 5,733 million. the present estimate is about 5 percent smaller than the early-season forecast. about 60 percent of the world total. Turkey tie only Asiatic country reporting that grain, is slightly above average. to wheat was reported and the crop is tentatively placed at 175 million bushels. sideratly larger than the prewar average. the next harvest. In prewar years, this region was on a net export basis. In Egypt. country's needs during the coming year, . Sbuntry's needs during the coming year. 7, about 50 million bushels were exported. Xn France, the Netherlands, and other areas. destination, are shown in table 8. T47 and 1947-48 had been fixed at 1.55. 1950 will participate equally in any surplus that might accrue as a result of '..
operations of the Canadian Wheat Board during that period. purposes as meeting the guaranteed minimum price in lean years. acres Bushels Bushels acres Bushels Bushels. 1940....: 43,536 13,6 592,809 18,284 12.1 221,85"
1942....: 38,855 18.1 702,159 14,145 18.9 267,222. 1943....: 38,515 14.0 537;476 17,469 17.5 306,337. / Seeded previous fall. .:. Mil. bu. Mil. bu. Til. bu. Vil. bu. il. bu. Stocks 1909-22 partly estimated to include same oositions as currently reported. ited States; the.latter has usually been between 2 and 4 million bushels a year. 'i offers from complete figure by 1 due to rounding. 4/ iet imports. i.datW, only old-crop is shown in all stocks positions. tAsmling 510 for food, 88 for seed, and 250 for feed. : Mil.bu. Mil.bu. Mil. Mil bubu. Mu. bu. Mil.bu. Mil.bu. Mil. bu. Mil. bu. Mil. bu. only old crop wheat is shown in all stocks positions. 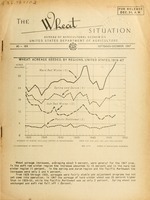 The figure for July 1, 1937, including the new wheat is . tories. Beginning with 1940 includes military exports for relief and exports by the Department of Agriculture. or carry-over into next year. 8/ Average is 246.0 when not adjusted for old crop wheat only. seat in transit and in :. Estimated by the Crop leportinc Board. the Government.or still ouLstandinc under Governm.nt loan. 1for 1928-33 in The 'heat Situation. December 1941, pace 18.
ported as flour from U. S. 'ports as well as U. 3. grain and grain products..
Asia8 .. ., ; . ; ..
S : 147,000 : ..
8 8 8 ., . 7,958 : 6,1 : . begin late in 1947 and end early in lAhf. F/ figures refer to harvested areas as far as possible. Y ield per acre calculated from acreage and production data shown, except for incomplete periods. L Estimate not adjusted to take account of inclusion of Southern Dobrdja and is, therefore, not strictly coomarable with estimatessahcn for later years. F/ ure for 1935 only. I Average of less than 5 years. SEstimates for Syria and Lebanon not shown separately during this period. Yugoslavia ............... 633 1.4 : 3 8,500 8 -. to conform to present boundaries, except as noted. harvests, which will begin late in 1947 and end eaxly in 1948.
g Figures refer to harvested areas as far as possible. / field per acre calculated from acreage and production data shown, except for incomplete periods. ej Estimate not adjusted to take account of inclusion of Southern Dobrndja, and is therefore not strictly comparable with estimates shown for later years. / igure for 1935 only. h/ Average of less than 5 rears. July 18 .......... 284 249 241 : 216 .